The Napili Gardens - Kiwi Mango Combo is compose of Kiwi Condo and Mango Condo. With 6 bedrooms n total, the combo can accommodate up to 16 guests. These properties at the Napili Gardens are nestled just south of Kapalua Resort in a small beach town that still feels and looks like a throwback to the 60s. 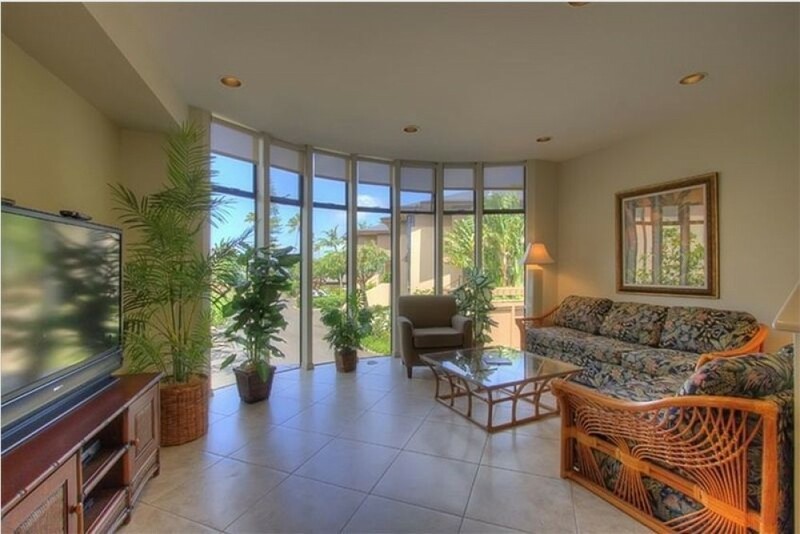 It is directly across the street from the pristine aqua blue waters of Napili Bay Beach. The two condo units is a small complex with only 17 units, so you won't be surrounded by too many visitors. The Kiwi Condo is a quality townhome that features floor to ceiling windows in the front with a lush tropical garden setting in the backyard. It's ideal for those traveling with family and appreciate the extra space and a third bathroom! The total remodeling of the entire home was completed in 2008. Granite countertops throughout the kitchen and bathrooms, all new stainless steel high end appliances, all new furnishings throughout the living room and each of the three bedrooms, along with all new bathroom fixtures, and new lanai furniture. All essential comforts of home that most families come to expect while traveling are available in the property. A huge flat screen TV is in the living room along with DVD/CD player. There's also a flat screen TV in the master bedroom. Central AC is outfitted throughout the house in addition to ceiling fans for added comfort. Beach toys are provided and they are kept in the two car garage where you'll also find the full size washer and dryer. Upstairs in the master bedroom is a very comfortable King size bed and en suite full bath. The two additional guests bedrooms and full size bathroom is also located upstairs. Downstairs is the half bath just off of the dining room and the Queen sleep sofa is in the living room to accommodate up to 8 people quite comfortably. Enjoy this newly remodeled unit and take advantage of having your own private backyard complete with a high end gas barbecue grill. When headed for the beach simply walk across the street to Napili Bay Beach famous for it's superb snorkeling and swimming conditions. And just stroll to the end of the beach is the Seahouse Restaurant...dine and be delighted! Don't forget to take a stroll at sunset and just linger a little longer for the magnificent starlit night show! We look forward to your visiting our home and becoming part of our loyal ohana. Aloha! Napili Gardens - Mango Condo features townhomes with private backyards, gas BBQ grill, 2-car garage, and a washer and a dryer. Upstairs is the master's bedroom with a King Size bed, sitting area, and master bath along with the two guest bedrooms and additional full bath. Downstairs is the half bath and a queen sleeper sofa in the living room to comfortably accommodate up to 8 people. You'll find three TVs, DVD/VHS,and CD player along with all the standard amenities of a home. Central AC is outfitted throughout the house in addition to ceiling fans. Also provided are beach toys that are kept in the garage. Nearest Supermarket - less than 5-minute drive to Napili Market, less than 10-minute drive to Costco.